Few things remind us of the importance of water as the lack of it – as in the Valley, and hundreds of other places I’ve traveled. Some three days without it and the human dies, I know, I’ve seen it. Short of oxygen nothing is as important, yet today, nearly a billion people have no access to clean water, and due to climate change, those numbers are climbing. Simply, tomorrow even more people face this horrible reality. Its time to make a change, its time to take action and do our best to combat the ever increasing water crisis – awareness is only the first step. As little as $5,000 drills a well like the one above. 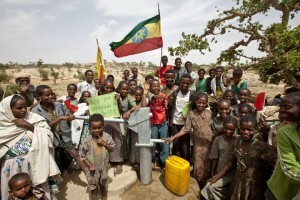 See www.charitywater.org and consider donating today. All sponsorship proceeds, photo and film revenues from this expedition will go to drilling bore holes in Ethiopia, the birthplace of all humans, and from where all our ancestors trekked.